This article is the second in a series of articles dedicated to the changes in the new NFPA 80. You may read these articles in any order, but the first article includes some helpful tips for accessing NFPA 80 online. Tips for highlighting your copy of NFPA 80 are also in the first article. As we go through the following changes, remember the provisions and requirements of Chapter 4 General Requirements apply to many of the fire door assemblies covered in NFPA 80. Users need to refer to both Chapter 4 and the applicable chapter for each particular fire door assembly. Additionally, several other changes occur in this chapter. Changes in Section 4.1.3 Appurtenances include reordering its existing content and adding new requirements. The term appurtenance refers to many items (e.g., door hardware) that attach to fire door assemblies. Factories prepare doors and door frames for hardware items that require mortised cutouts and reinforcements. This type of work is made according to “…the manufacturer’s inspection service procedure and under label service” (see 4.1.3.1). In other words, only the factories or their authorized (licensed) distributors prepare doors and door frames for hardware in their shops. Authorized distributors subscribe to periodic inspection services from a nationally recognized testing lab (e.g., Underwriters Laboratories and Intertek/Warnock Hersey). During installation, installers in the field drill holes in the doors and frames for surface-mounted hardware. Section 4.1.3 lists the preparations made by the factories and the installers. Since NFPA 80 limits work in the field to drilling round holes during installation (see 4.1.3.2.1), all other work is done by the factories or authorized distributors. No changes occur in paragraph 4.1.3.1. Work that is expressly allowed by installers is in paragraph 4.1.3.2*, which is now in list format for improved readability; there were no technical changes. Follow the asterisk to paragraph A.4.1.3.2 in Annex A, which is new; it explains undercutting of wood and composite doors. The term undercutting refers to the practice of removing a portion of the door leaf, across its width and parallel to the bottom edge, to reduce its height. Undercutting doors increases the clearance dimension between the bottom of the door and finished floor. 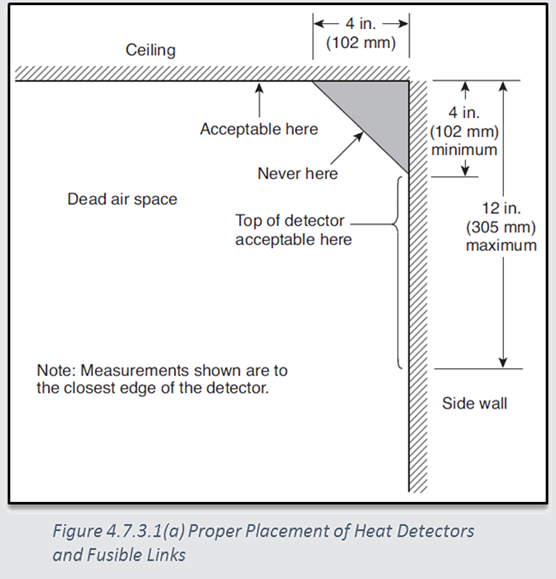 NFPA 80 limits the maximum clearance under a door to ¾ in. (see 4.8.4.2). When the clearance under the door leaf is already ¾ in., undercutting the door is not allowed. Sometimes clearance under the door is less than ¾ in. and undercutting of the door might be necessary for it to swing easily. Taking too much material off the bottom of the door structurally weakens it and might cause it to fail in a fire. When considering undercutting wood and composite doors, verify with the door manufacturer first since undercutting some doors is not allowed. Otherwise, installers might unknowingly ruin the doors. Note: While not expressly prohibited by NFPA 80, trimming wood and composite doors in width (e.g., planing the vertical edges) is not allowed. Nor, is trimming the top edge of wood and composite doors. 4.1.3.2(2) only allows undercutting of wood and composite doors. Paragraph 4.1.3.2.2 now includes the phrase; “…unless otherwise permitted by 4.1.3.2.3.” New paragraph 4.1.3.2.3 recognizes that some door hardware items require round holes that are greater than 1 in. (25.4 mm) in diameter. Drilling of larger holes is allowed, as long as both the listing of the door and hardware item allow it. New paragraphs 4.1.3.2.4 and 4.1.3.2.5 include provisions for drilling raceways in doors. A raceway is a long hole that is bored through the width of the door. Adding electrified locking functions to existing fire-rated doors is common, which requires a raceway in the doors. In fact, several years ago, Intertek developed training and certification for individuals doing this kind of work, it’s called the Perfect Raceway Program. Installers attach their drilling equipment to the hinge edge of the door and bore a hole through to the lockset cutout in the lock edge. Next, installers pass a cable consisting of stranded copper conductors (color coded). They drill another hole in the hinge reinforcement in the door frame. Through-wire hinges conceal the wiring that is passing from the wall to the door. Once completed, installers attach a supplemental label on the door. “4.1.3.2.4 Drilling raceways for wires when performed at the job site shall be in accordance with the door manufacturer’s listing and when permitted by the laboratory with which the door is listed. 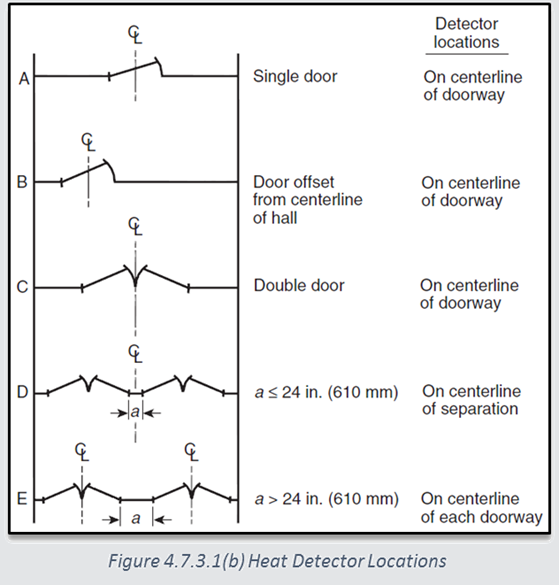 Before drilling raceways in existing doors, verify the listing of the doors includes raceways. (Remember, the term listing refers to how one of the national testing laboratories recognizes that manufacturer’s products—the testing lab publishes a listing for those products.) Current manufacturers’ websites contain technical information, which might include their listings. When the listing of the door includes raceways, verify the testing laboratory whose name is shown on the label of the door permits this work. Older doors and doors from obsolete manufacturers might not have been tested or listed with raceways. Paragraph 4.1.3.2.5 states installing raceways in these doors is a field modification and is subject to paragraph 5.1.5.1 under Field Modifications. Section 4.2 Listed or Labeled Products contains a great deal of new content. Labels on fire-rated door assemblies are extremely important, especially after installation. Inspectors, building supervisors, and maintenance personnel need know which doors are fire-rated. These labels tells us who made the doors, who tested the doors, and the level of fire-protection rating of the door. Depending on the type of fire door, the label might contain more information such as latch throw, fire exit hardware, degree of temperature rise, and smoke door (the so-called S-label) compliance. The manufacturer’s name or a code that can be traced back to the manufacturer. The marking of a third-party certification agency. The fire protection rating of the door. A unique serial number, if provided by the listing agency. The fire test standard designation to which the assembly was tested. Note: Follow the asterisk on item (7) to paragraph A.4.2.1.1(7) in Annex A. Fire door labels on swinging doors list the minimum latch throw (sometimes called projection) for single doors and pairs of doors (see Fig. 1). In most cases, single doors require ½ in. latch throw and pairs of doors require ⅝ in. or ¾ in. latch throw. Latch bolt throw is important because it ensures latching hardware engages the strike plates sufficiently, such that the doors will remain closed in a fire. Where the operational clearance dimensions between the doors and door frames or between meeting stiles of pairs of doors are greater than that allowed by NFPA, latch bolt engagement in the strike plates in reduced. For example, wood fire doors are allowed up to ⅛ in. clearance between the door and door frame. Latch bolts with ½ in. throw (projection) project about ⅜ in. into the strike plate and will securely hold the doors closed in a fire. When the clearance between the door and frame is greater, the projection of the latch bolts into the strike plates is reduced. These doors are likely to fail in a fire. Another item that is listed on some fire door labels is fire exit hardware. When fire exit hardware devices are used, the fire door label needs to state “Fire Door to be Equipped with Fire Exit Hardware”—which is stated in 4.3.3. Some hollow metal door companies print their fire door labels with the minimum latch throw dimensions and include the statement “Fire Door to be Equipped with Fire Exit Hardware” (see Fig. 2). In the case of 20-minute (1/3-hour) rated fire doors, many of these doors are not required to pass the hose stream test after passing the furnace test. NFPA 80’s labeling requirements require the fire door labels attached to these doors to include a statement that the doors were not subjected to the hose stream test (see Fig. 3). Starting with paragraph 4.2.1.4, NFPA 80 lists the information needed for labels attached to fire door frames. Unlike the labels for fire doors, the labels for door frames do not include hardware requirements like latch throw and fire exit hardware. Nor, are they rated for temperature transmission rise. The manufacturer’s company name or a code that can be traced back to the manufacturer. The fire protection rating of the frame. The fire test standard designation to which it was tested. 4.2.1.4.1 Fire door frames rated at 3 hours when installed with masonry anchors in masonry walls or rated at 1 ½ hours when provided with wood stud or steel stud anchors and installed in gypsum board walls shall not be required to be provided with a fire protection rating. 4.2.1.4.2 In lieu of 4.2.1.4.1, fire door frames shall be marked with the label or embossment of the third-party certification agency and the manufacturer’s name or a code that can be traced back to the manufacturer. NFPA 80’s requirements for fire door frame labels follows the long-standing industry practice. Embossed labels are stamped into most fire-rated hollow metal door frames; some have metal labels. Aluminum, pressed steel, and wood fire door frames have metal or Mylar-like labels. 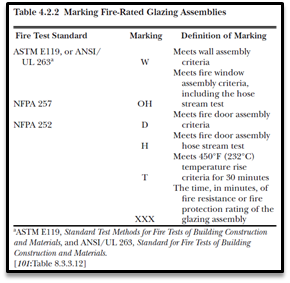 Frame labels for side light and transom light door frames might include the hourly rating of the frame, which matches the fire-protection rating of the door leaves (see Fig. 4). Most fire-rated side light and transom door frames are rated for 45-minutes (¾-hour) or less (see Fig. 5). Fire resistance-rated side light or transom light door frames are used where the fire ratings greater than 45-minutes are needed. These types of side light and transom light door frames are tested to ASTM E119 or UL 263 standards, rather than NFPA 252, UL 10B, or UL 10C and require fire resistance-rated glazing materials. In these cases, the labels state the fire resistance rating, not the fire protection rating of the door frame. Frame labels for side panel and transom panel door frames might include the hourly rating of the frame. Depending on the application, side panel and transom panel door frames are fire protection-rated for up to 3 hours. Oversized fire doors cannot bear the standard fire door labels because they are too large to be tested. NFPA 80 and the model building codes allow the use of oversized fire doors, as long as they are labeled (or a certification of construction is on file), with the Authority Having Jurisdiction (AHJ) approval. Since the doors are too large to be tested, factories build the doors using the same materials, processes, and techniques as their fire-tested products. Engineering evaluation by third-party certification agencies (e.g., UL, Intertek/Warnock Hersey, and FM) determines the oversized fire doors meet the construction and quality of the standard products. The National Fire Protection Association (NFPA) released the 2016 edition of NFPA 80, Standard for Fire Doors and Other Opening Protectives a few weeks ago. The new NFPA 80 contains several significant changes that users need to know, as well as how these changes might affect their work. You can read NFPA 80 read online (free) through their website, you can also buy it as a pdf file. Printed copies will be available soon. NFPA used to mark changes that appeared in their new codes and standards, which made them easier to follow. They stopped marking the changes in their editions in 2014. If you want to study the changes that occur in the new NFPA 80 on your own, you can read the First and Second draft reports on NFPA's website. (Click on the Read Archived revision information link, and choose the first and second draft reports.) Not only will you see the changes, but you'll also see the committee and public input proposals from the last review cycle. You'll see how the technical committee resolved the proposals and their reasons for accepting or declining proposed changes. It takes time and practice to learn your way around NFPA's online code and standard development system. It helps you better understand how these publications evolve. This article is the first in a series of articles that discuss changes in the new NFPA 80. You will find it helpful to have a copy of NFPA 80 to refer to as you read these articles. If these articles are your introduction to NFPA 80, you might have some difficulty following their context. NFPA publishes a handbook for NFPA 80, which you can use to learn more about it; the 2016 handbook will be available by the end year. Meanwhile, you can buy the 2013 handbook. Make notes and highlights in your copy of NFPA 80 to help you later when you need to look up something. Tip: Before highlighting your copy of NFPA 80 (or any reference book), think about how the marked up content might appear. Using a single color pen or marker changes the color of the page when highlighting a large area of text and might not be useful to you later on. Consider using different color markers, and only highlight the paragraph number or keywords and phrases that draw your attention. Write notes in the margins, especially when you might need to refer to related provisions and requirements in other sections or chapters. In other words, make your copy of NFPA 80 yours. Make it work for you. New Chapter 21 Fire Protective Curtain Assemblies. New glazing requirements in Chapter 4 General Requirements. New clearance requirements for Chapter 6 Swinging Doors with Builders Hardware. 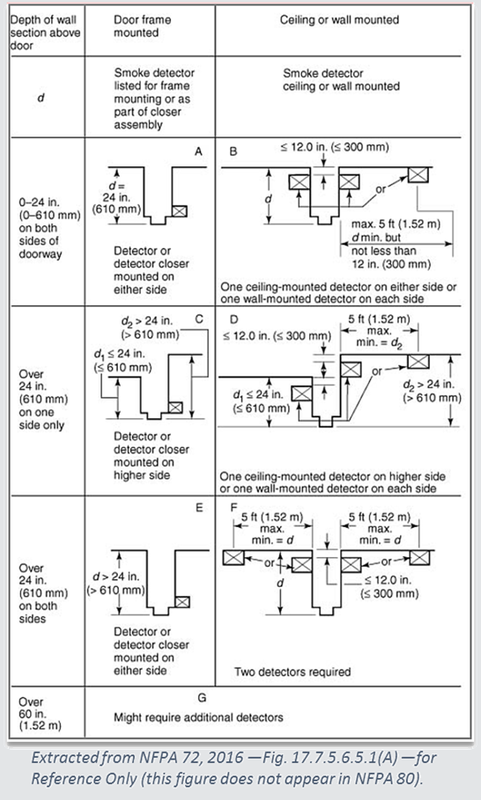 A new section in Chapter 5 Inspection, Testing, and Maintenance for Field Labeling of existing door assemblies. Revised and expanded provisions for Appurtenances and work that can be done at the job site. Expanded requirements for the installation of heat and smoke detectors, as well as fusible links. This series of articles covers all of these changes, and more. Before we go any further, it is worth pointing out how NFPA publications use asterisks (*). An asterisk that follows a section or paragraph number tells you there are additional comments in Annex A Explanatory Material. Annex A's comments provide users of these publications with background information and context. As you study NFPA 80, read Annex A's comments whenever you see passages marked with an asterisk; it is worth the time. For simplicity's sake, we'll present the changes in the order they appear in NFPA 80; starting with Chapter 1 General and working our way through each of the following chapters. Editorial changes or renumbering of sections and paragraphs are not covered in these articles. The only change in Chapter 1 General is in paragraph 1.1.4. A reference to ANSI/UL 263, Standard of Fire Tests for Building Construction and Materials was added as an equivalent standard to ASTM E119, Standard Fire Test Methods of Building Construction and Materials. In fact, references to ANSI/UL 263 appear throughout NFPA 80 wherever refers it to ASTM E119. Many of the changes in Chapter 2 Referenced Publications reflect the most recent publication dates of the codes and standards listed in this chapter. In other words, the list of publications is nearly the same as the list that appeared in the 2013 edition of NFPA 80, only the dates of some publications were updated. As you read NFPA 80's provisions and requirements elsewhere in the standard you will see references to the publications listed in Chapter 2. Wherever an NFPA code or standard is referenced, only its number is shown (e.g., NFPA 72, NFPA 252). References to publications from other sources (e.g., ASTM, BHMA, and UL) include their number and full title. Since the titles of these references rarely change, knowing which edition is being referenced is important. Significant changes in codes and standards sometimes occur, which might add new requirements to NFPA 80; that makes knowing their publication date important. NFPA 4, Standard for Integrated Fire Protection and Life Safety System Testing, 2015 edition. ANSI/UL 10D, Standard for Tin-Clad Fire Doors, 2009, revised 2009. 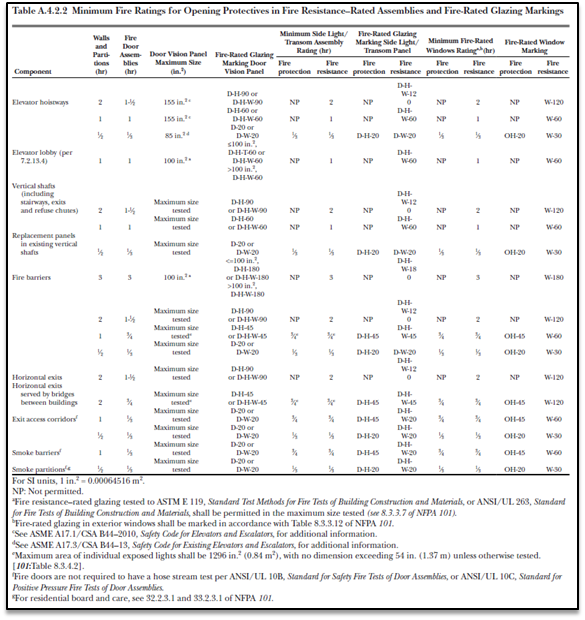 ANSI/UL 263, Standard for Fire Tests of Building Construction and Materials, 2011. NFPA 82, Standard for Incinerators and Waste and Linen Handling Systems and Equipment, 2014 edition. NFPA 82 and NFPA 101® are listed under Section 2.4 References for Extracts in Mandatory Sections, which means that some of their provisions and requirements are extracted for use in NFPA 80. We'll see examples of how these extracted requirements are used in NFPA 80. A couple new definitions were added in Chapter 3 Definitions. The first new definition is 3.3.58 Fire Protective Curtain Assembly. It states: "An assembly typically consisting of a fabric curtain, a bottom bar, guides, a coil, and an operating and closing system." This definition applies to the types of assemblies covered in new Chapter 21 Fire Protective Curtain Assemblies. New definition 3.3.127 Threshold states: "A builders hardware component that is installed beneath a closed door." The terms threshold and sill are sometimes used interchangeably in the field, but in the context of NFPA 80 (and the building codes) each term has particular application. Hence, the need to add a formal definition of the term threshold. Thresholds are one of many builders hardware components that can be used on fire-rated door assemblies. There are no code requirements that require thresholds on fire-rated door assemblies. Thresholds can be installed under a fire-rated door, on top of non-combustible sills, to seal the gap under the doors. Where thresholds are part of a listed assembly (e.g., 20-minute prehung insulated steel door units), they are required by the assembly's listing. Additionally, the definition for 3.3.111 Sill was revised to clarify the difference between sills and thresholds. The new definition states: "A structural component of the building that forms the bottom part over which a door closes." In buildings that have combustible floor construction (e.g., wood floor joists), sills prevent wood floor joists from extending under door openings. In other words, sills are part of the construction that directly supports door openings in the walls above. Building codes require non-combustible sills to be constructed under fire-rated door openings. Sills prevent a fire on one side of a fire-rated door assembly from spreading under the door opening. Even when the flooring system burns away completely, the door assembly remains in place because the sill protects the area under the door assembly. A reference to ANSI/UL 263 was added to definition 3.3.61 Fire Resistance Rating as an alternative to the test procedures of ASTM E119. Lastly, the definition 3.3.93 Power-Operated Fire Doors was modified to include hydraulically operated doors, it states: "Doors that normally are opened and closed electrically, pneumatically, or hydraulically." Thank you for reading this article. You may contact me directly at kpardoe@pardoeconsultingllc.com with questions and comments regarding this series of articles. You may also connect with me on LinkedIn. Next Up: Changes in NFPA 80's Chapter 4 General Requirements.